Dubai is the largest city, and second largest territory, in the United Arab Emirates. Surrounded by vast desert, yet located on the coast, Dubai is in the perfect location for some splendid diving. Scuba diving in the Middle East is especially exhilarating, as descending beneath the water is the perfect antidote to the surrounding, comparatively lifeless desert. Water temperature is consistently warm, averaging around 22.8 Celsius and sometimes maxing out at around 33.9 Celsius, making it pleasant for diving without a wet suit. Getting to Dubai is not always cheap, but if you check flight & hotel comparisons sites like 786hotels or hotels combined you can get some fantastic last minute flight and hotel deals. There are many locations to dive in the waters surrounding Dubai and the UAE, as well as many professional and excellent dive shops to service your dive. If you are not yet certified as a scuba diver, most of these shops provide all of the necessary training with certified dive masters. Scuba diving is an excellent way to complement any travel. After all, how can you truly call yourself a world traveller if 70% of the world is covered with water? 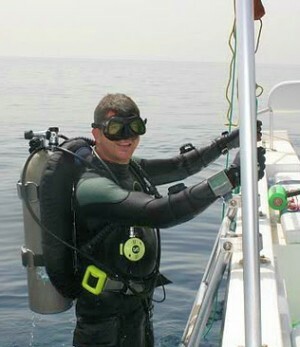 Some dive shops are built into and operate under the supervision of a resort or hotel. This is a very convenient way to dive as your shop is located on the same grounds as your hotel, sometimes right on the water. Many dive shops located on the beach have a "house reef" that is a short distance from the shop itself. Dive shops with your hotel will know the best places to visit on a daily basis, according to the varying day to day dive conditions at different sites. 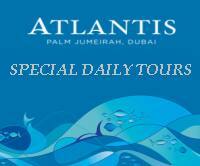 In Dubai, diving can consist of wreck diving and/or natural or artificial reef diving. The M.V. Dara is one of the most popular wrecks to visit due to its dive conditions and accessibility. It was a passenger boat that crossed the Arabian Gulf regularly, when a bomb exploded on board and caused it to sink off the coast of Dubai in the early 1960s. Approximately 238 passengers died in the accident, making it the second most tragic boat sinking, after the Titanic. She hit the bottom on her starboard side, resting in 17 meters of water, making it an easy dive for all certifications. There is a lot of marine life, and depending on visibility conditions, it can be a very exciting dive. Some marine life that you can expect to see, diving in the Gulf of Oman: sting rays, cuttlefish, squid, octopus, manta rays, moray eels, dolphins, all sorts of colourful reef fish, shark rays, and harmless sharks. Visibility in the waters off Dubai vary depending on local weather (rainfall and temperature), as well as onshore activity (i.e. construction and dredging activities). The summer season lasts from May to October, where temperatures on land can reach up to 48 Celsius. This makes diving an excellent respite from the heat of the desert. Winter is from November to April and this is when most of the rain falls, and temperatures can range from 4 Celsius to 25 Celsius. Getting to your diving location is easy; take out car hire to drive to the marina and then a short boat trip will take you to right place. 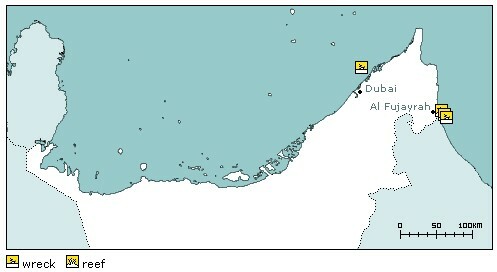 Dubai - Poor, 3 metres (10 feet) - 10 metres (30 feet) due to dredging works.